Focusing on race-winning performance, along with making a positive contribution to a unique and challenging endurance sport, Team QRILL Pet is more than ‘just’ a team. Our mission is to indisputably become the best long distance dog sled team and set a new standard for all sports teams in the world. 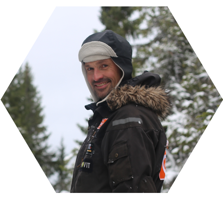 We believe that we can create a better understanding of the sport and a unique foundation that will set new standards in the world of dog mushing. To achieve this, we have brought together the best athletes and industry players to form a team that will strive to lift the whole universe of the sport. Together we can advance pet nutrition and race-equipment and drive new research to improve the well-being of the dogs and athletes. We will also foster recruitment to ensure the next generation of the sport. The predominantly Norwegian team includes Thomas Wærner, Marit Beate Kasin, Joar Ulsom and Dallas Seavey from the USA. Matching race winning experience with future talent, Hanna Lyrek is the youngest team member. The team aims to win the top three long-distance races, Iditarod, Finnmarksløpet and Femundsløpet. 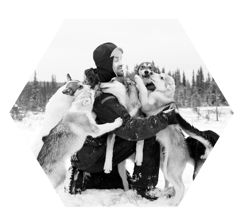 Thomas Wærner (45) is a professional long distance dog musher and dog breeder. He owns and runs the Berserk kennel in Synnfjell, Norway and was crowned as the best dog breeder in 2013. In the same year, he won the Finnmarksløpet in 2013 and came 3rd in Femundløpet. In 2015 he was crowned as “Rookie of the year” at the Iditarod race, where he finished 17th. He also has a total of 6 international medals. Besides his devotion for his dogs and the sport of dog mushing, he runs the company EveryCare AS. Originally from Oslo, Thomas today lives with his family and dogs in Synnfjell. 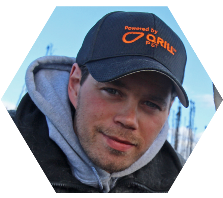 I JOINED THE QRILL PET MUSHING TEAM BECAUSE I BELIEVE THAT WE CAN MAKE THE SPORT GREATER. THE TEAM SETUP WILL NOT ONLY BE BENEFICIAL FOR THE MUSHERS, BUT ALSO FOR THE DOGS, THE RACES AND EVERYONE INVOLVED IN DOG MUSHING. WE HOPE TO MOVE THE SPORT FORWARD AND INVITE MORE TEAMS TO THE SPORT. Joar Ulsom (32) is a professional long distance dog musher and 2018 Iditarod Champion. Joar became the first non-native winner of Nadezhda Hope race in Chukotka (Russia)—the “toughest race in Eurasia.” Joar is now a 2-time Nadezhda Hope champion and holds the fastest race record. 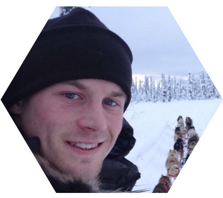 Since 2011 Joar lives with his dogs in Willow, Alaska, where he owns a small kennel while taking part IN the Racing Beringia programming for the non-profit GoNorth! Adventure Learning. 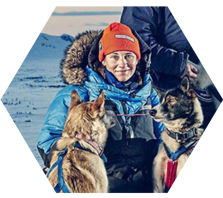 Marit Beate Kasin (34) is a Norwegian musher and journalist. In 2008, she started her kennel Vinterdans (Winter Dance), which currently consists of 40 Alaskan huskies. Vinterdans competes in the longest races in Europe, which includes Femundløpet (600 km) and Finnmarksløpet (1000 km). During her mushing career, she has had many good achievements, among others, winning the best rookie award in Finnmarksløpet in 2015, Norwegian Champion in 2016, and receiving the prize of overall winner at Finnmarksløpet in 2016 and 2017. Her goal is to compete in all the world’s longest sled dog races. Marit combines dog-sledding with the passion for writing. She is the author of the critically acclaimed book “Vinterdans”, a narrative non-fiction book about long-distance mushing. one of only 6 people ever to hold a title in both races. Hanna Lyrek (18) is the youngest team member and will join the team as the first young talent part of the recruitment strategy. She lives with her family and their dogs in Alta, Norway. She went on her first own dog sled trip at the age of 4 in Alaska, where she lived as a young child before moving to Alta. 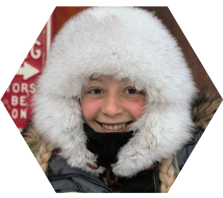 After three years as a junior musher, she is finally old enough to participate in the longer races. Hanna has already completed Bergebyløpet 650km and Finnmarksløpet 1200km. She strives to become one of the top mushers in the years to come. Along with Aker BioMarine’s brand QRILL Pet, the team is sponsored by Felleskjøpet with their dog and cat food brand Appetitt, Non-stop Dogwear, and Hundeskjører Butikken. We hope to extend the partnership to a global level whilst the attention to the sport grows. We see great potential in the sport of dog mushing. Thanks to this incredible sport and our inspiring mushers we will be able to really drive innovation, improve dogs’ health, along with promoting the sport. Sled dogs are special animals that need a special diet designed to cover their nutritional needs. With this in mind, QRILL Pet has set on a journey to investigate the sport of dog mushing. The brand had a fantastic experience with a pilot sponsorship over the last years with Sigrid Ekran, Thomas Wærner and Joar Ulsom, helping to improve their dogs’ overall endurance and well-being. In a study with 5 weeks of 8% krill meal inclusion in diets for Alaskan Huskies prior to the 2016 Iditarod dogsled race – a thousand mile endurance exercise known to induce muscle damage and inflammation – showed that the 40% increase of the Omega-3 Index in the krill group decreased muscle damage and inflammation when compared to the control group. Now, QRILL Pet wants to take the sponsorship to the next level and thrive further research to improve the health and well-being of sled dogs, while building the sport and reaching more awareness globally. Appetitt is a Norwegian super premium dog and cat food brand owned by Felleskjøpet Agri. Appetitt is produced with only high-quality ingredients where a majority of the ingredients are sourced from Norway. The most popular selections contain a high inclusion of QRILL Pet, a superior source of omega-3s for pets. Each selection of Appetitt has been developed with major research and care. The content of energy, protein, fat, minerals and vitamins in the various types are optimized and cover the different needs for every dog size. With Appetitt every dog will always get a feed adapted to their needs. Having a deep understanding of the nutritional needs of dogs, Appetitt has developed a special formulation for sled dogs to cover the needs of these unique athletes. Non-stop dogwear was founded in Norway, 2009. Today Non-stop dogwear develops, designs and sells high-quality dog equipment worldwide, currently, you can find their products in over 1,000 stores in 22 countries. Non-stop strives to make the best dog equipment. The company has been a long time player in the sport of dog mushing, not only supplying equipment for the dogs but also producing unique jackets for the athletes. Consisting of a young team the company has a "can do" attitude and is a perfect partner to bring the sport of dog mushing forward. Hundekjører Butikken is specialized in developing and selling high-quality equipment for the sport of dog sled racing. Having been a long-term sponsor of Marit Kasin and having set their heart on dog mushing, Hundekjører Butikken will continue to provide her with the best equipment needed. They will also be a sponsor of Hanna Lyrek. The Iditarod Trail Sled Dog Race is also known as the Last Great Race on Earth, is an annual long-distance sled dog race held in March. Started in 1973, the race covers a trail from Anchorage to Nome in Alaska and is one of the toughest and highly competitive races. The Mushers and a team of 16 dogs cover a distance of 1000 miles / 1600 km in 8-15 days. Finnmarksløpet is Europe’s longest and the world’s northernmost sled dog race. The race was first to run in 1981 and covers a distance of 1200 km across Finnmark in Norway. The Femund race is an annual long-distance dog sled race started 25 years ago. The race starts in the historic mining town of Røros, which is listed among UNESCO's World Heritage Sites. *If you wish to get in touch with the team, are interested in becoming a sponsor or forming your own team, please contact us through the link below.